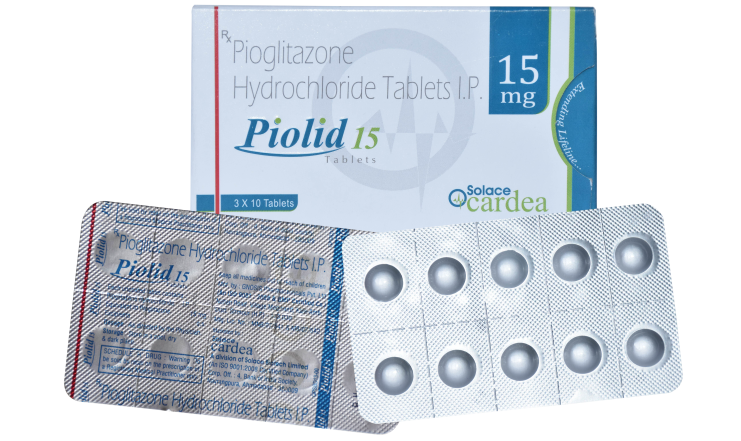 Piolid 15 tablets contains pioglitazone. It belongs to the class thiazolidinedione. It mainly causes hypoglycemic actions to treat diabetes. Once daily can be taken without meals. The drug is agonist for PPAR receptors (peroxisome proliferator-activated receptor) which is important for insulin action. It also causes resistance of insulin in liver which causes decrease in hepatic glucose output. After oral administration the drug attains its maximum concentration in 2 hrs. About 99% of the drug is bound to protein. It is metabolized by oxidation and hydroxylation. About 15-30% of the drug is excreted through urine. Hypersensitivity to any of the ingredient.